NUVU are renowned for manufacturing a fantastic range of internal bifolding doors. The Porto range of bifolding doors is easily identifiable by their full size glazed panels. The frosted glass has the added benefit of maintaining privacy between rooms whilst still allowing a substantial amount of light through. 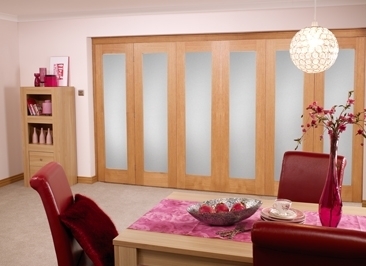 The doors you see on this page are supplied prefinished and require no further decoration on site. We find that this range is extremely popular in refurbishments where rooms are split to give a more formal dining room on one side, and a warm and cosy living space in the other. Available in 3-6 door systems, using 1’9”, 2’0” or 2’3” internal doors, getting the perfect fit is simple, and installation is a breeze. When deciding on the right configuration for your home, please take the time to review your structural opening size and the size of the product in question. If you require any assistance, please don’t hesitate to get in touch with our friendly and knowledgeable team who would be more than happy to help. These sets are supplied with unfinished frame, hardware pack, and preglazed prefinished doors. The set excludes drop bolts and handles/latch to allow you to match your existing ironmongery.